Wichita Falls makes a great day trip from Fort Worth — or anywhere in North Texas. If you’ve never been to this city of 100,000 people located 120 miles to the northwest, you may be surprised that it’s a vibrant college town with plenty to do. While the downtown and some other parts of the city still appear largely neglected, that doesn’t tell the whole story. Locals insist there is slow improvement in many areas of the city. When judging any town against the vibrancy and variety of things to do in Fort Worth, it’s sure to fall short. But if you’re dying to see something different and get out of the Fort for a day or two, you should consider some time in Wichita Falls. Since I grew up in declining Jacksboro — halfway between Wichita Falls and Fort Worth — I experienced both towns regularly as a kid. It’s obvious which became my favorite, but Wichita Falls has more to do than ever. And that unique red dirt makes you feel like you’ve left the Metroplex behind. A highlight of the trip was the River Bend Nature Center, which has a small entrance fee. If you come with children, there are activities that could occupy the family for hours. For us, the visit started with a quick walk around the educational area to see the insects and snakes exhibited there. A young and knowledgeable guide who considers the creatures on exhibit his personal friends made this enjoyable. We also explored the glass conservatory with the required docent and visited the prairie dogs and butterflies. Then we ventured off on the nature trail on our own. There is both a well-maintained accessible trail and a rougher version on which we managed to get lost. Located on the campus of Midwestern State University, this museum is larger than you might expect. But don’t expect any classic works of art. And strangely, getting to the building requires going through a shopping center parking lot. Once there, you’ll find a cavernous main gallery and three smaller ones. The main exhibit when we visited was an uninspiring look at works by a Metroplex artist. Two of the smaller galleries were more compelling and featured some local works. Allow only an hour or less to see the museum, but it’s worth a stop, and there’s no admission charge. The building features a new performance area just outside the front entrance. 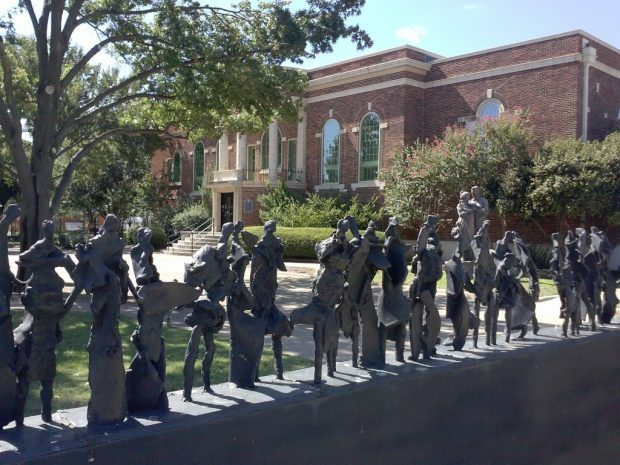 Another highlight of our Wichita Falls trip was the free Kemp Center for the Arts. This historic building features rotating exhibit space and an outdoor sculpture garden. It was easy to see from the surrounding neighborhood why the building has an overstated fence around it. The center also hosts events in it’s elegant Great Hall and houses the Wichita Falls Symphony offices. Be sure to see both floors of art inside, and slow down a bit and wander around outside in the garden area if the weather permits. The receptionist downstairs will point you to the best bits. The strangest of the things we visited in Wichita Falls, the Museum of North Texas History is dominated by junky and fading exhibits and hand-typed note cards. But there are interesting miniatures, lots of military history exhibits and a display about how oil wells work. 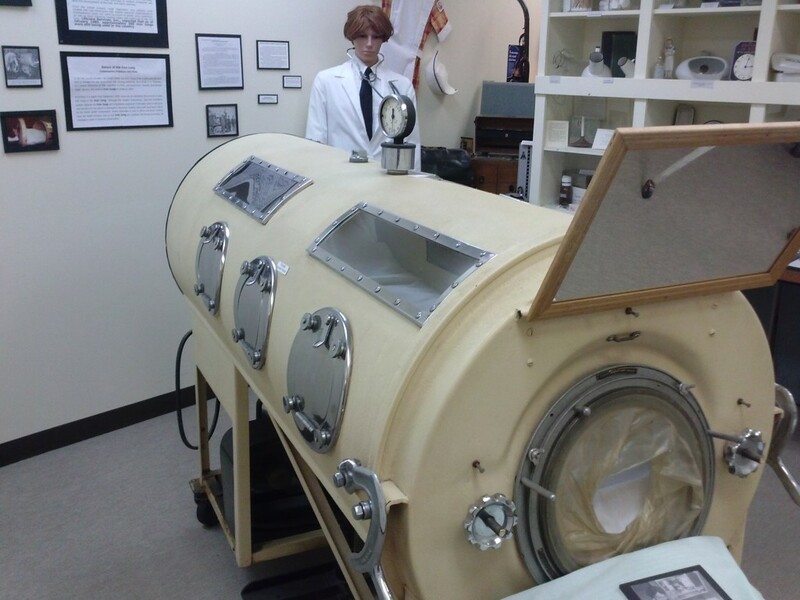 Plus, they have an iron lung, a medical relic I had never seen before. Since it’s free, it’s worth a brief visit, but you won’t find exhibits of the quality and interactivity that you expect from modern museums. Located in a poorly maintained area of town near a free veterinary clinic with a line of people waiting outside it the morning we visited, the signage and trails around the sculpture are a bit rough as well. But the sculpture is beautiful and compelling. It’s based on a legend about the how the town got its name, although most agree the legend couldn’t be true. I remember the campaign to build the falls when I was a kid. And I remember that the river was so muddy on dedication day that they pumped in water from fire hoses for the dedication so it wouldn’t look so bad. Today, there’s a nice walking trail from the Lucy Park parking area to the falls — or simply view them as you pass on I-44. Closed on the day we tried to visit, the Kell House Museum looked a bit rundown from the outside. Still, it’s promoted as one of the most significant buildings in the city from an architectural standpoint and is billed as featuring original furnishings, costumes and decorative arts. Guided tours are available, but they aren’t open on Wednesdays. You don’t need to worry with the World’s Littlest Skyscraper. While the story is interesting, it’s only a small antique store down a narrow alley. If you find that the town doesn’t impress you, use up your remaining time wandering Sikes Senter Mall, a mainstay of the town for decades. Plus, choosing to visit during one of the many Wichita Falls events helps ensure a better experience for certain travelers too. An iron lung at the Museum of North Texas History. From Fort Worth, you can access Wichita Falls from Highway 199 — which merges with Highway 281 at Jacksboro and is called Henderson Street or Jacksboro Highway around here — or from Highway 287. While Highway 287 is a better road, taking Highways 199 and 281 makes more sense unless you live where you can easily access the larger freeway-like road. If you take Highways 199 and 281, your trip takes you through Jacksboro and Windthorst. Neither town is particularly interesting, but there are two points of interest worth noting. You’ll enjoy seeing all the new wind turbines along the way too. Just outside Jacksboro, a very modest town with less than 4,000 residents, is Fort Richardson State Park (fee required), where you can see ruins and reconstructions of post-Civil War era buildings, enjoy a small lake, camp for the night or walk the nature trails. In Windthorst, a tiny blip of a town with about 400, you may enjoy a peek inside St. Mary’s Catholic Church, a beautiful and unique church with a famous grotto outside. Be sure to drive across to Windthorst General Store — also called the Old Weinzapfel General Store — an authentic mercantile that’s still in operation. Maybe a Wichita Falls day trip or weekend trip isn’t as exciting as a drive down to Austin or San Antonio. Even Oklahoma City has more to do. But when you choose to go to Wichita Falls, you’re choosing a route with less traffic and a town with absolutely no pretense. It isn’t a big town, but it’s an important regional hub with several worthwhile attractions. And it isn’t a beautiful town, but it has some beautiful and interesting spots you won’t want to miss. And if you can’t find enough to do, you can always keep moving. There’s a casino and the striking Wichita Mountains just to the north.